but of the human heart. The Partnership is a voluntary, cooperative effort to share resources and to develop a regional approach to resource protection. The Partnership is a fluid organization. Any government agency, non-profit conservation organization, educational institution, faith-based organization, industry, municipality or individual with a focus on our key areas of concern in the greater Thames River watershed and surrounding areas is welcome to participate in the quarterly meetings and other events. Click the map to “dive in” and learn more about the Thames River watershed. Protect the region’s agricultural and natural areas threatened by land use changes. Protect ground and surface water quantity and quality being threatened and degraded by contamination. Improve coastal zone resource conditions. 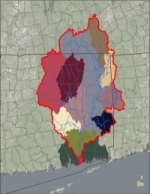 This TRBP website was funded in part by a Watershed Assistance Small Grant Program funded in part by the Connecticut Department of Energy and Environmental Protection through a US Environmental Protection Agency Clean Water Act §319 Nonpoint Source Grant, and administered by the Rivers Alliance of Connecticut. Additional project support was provided by The Last Green Valley, Inc, under a cooperative agreement with the Eastern Connecticut Conservation District.